Institute manager Paddy McLaughlin. Pic by Pacemaker. Institute manager Paddy McLaughlin wants his players learn from their recent trip to Linfield going into tonight’s clash at Coleraine. McLaughlin is looking for a better mind-set going into the test against last season’s Irish Cup winners. 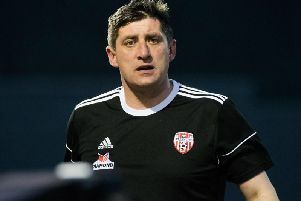 “It’s important that we start well, because if we are slow starters like we did in the cup last season then we could have the game wrapped, because Coleraine have the quality to do that to you,” he said. As for Bannsiders skipper Stephen O’Donnell he’s looking forward to coming up against old club. “To be fair I still have a good few mate’s there and I have said in the past I would love to see them doing well, but Friday night will be different,” he joked. O’Donnell is hoping the playing under the floodlights at the Showgrounds this evening will help Oran Kearney’s side bounce back from what their disappointing display at Glentoran. “Our performance wasn’t anywhere near good enough on Saturday,” he insisted. “It wasn’t anywhere near the levels we have set over the last 18 months so, first and foremost, this week is about us getting back to playing well, playing with the right attitude and the right mentality. If we do that, I’m sure we can get the three points. “There was a performance last year at home to Warrenpoint that maybe did something similar to us in terms of a wake up call. This year it has happened earlier but the Glens match gives everyone a chance to reset, really look at themselves, and ask ‘Where’s the hunger?’ and ‘How much do we want it?’ but I know the players will do that.